On September 8, 2000, more than 150 leaders of nations endorsed the United Nations Millennium Declaration. The declaration committed the countries of the world to pursue a set of specific goals and quantitative targets to improve the quality of life for people throughout the world. The body of the Millennium Declaration was translated almost immediately into a series of 8 specific goals and 21 quantitative targets—the Millennium Development Goals—that guided development aid and activities for the next 15 years. The goals dealt primarily with poverty, education, nutrition and health, but goal 7 specifically addressed ensuring “environmental sustainability.” In truth, however, the entire Millennium Declaration and all goals support an essential tenet of conservation and sustainability, as reflected by Indira Gandhi when she said that “poverty is the worst form of pollution.” Unless people are assured of a sufficiently high quality of life to provide for basic nutrition and security, they will not work toward higher goals of conserving biological diversity or protecting natural ecosystems and processes. Number of people living in extreme poverty was halved. Proportion of undernourished people in developing regions was nearly halved. Primary school enrollment exceeded 90%, including huge gains in girls in school. Infectious diseases and HIV/AIDS have been reduced substantially. Maternal mortality was nearly halved. More than 90% of the world’s people now have access to improved water supplies. In 2015, the Millennium Development Goals were replaced by a new, more ambitious set of “Sustainable Development Goals.” For example, goal 1 commits society to ending poverty, everywhere, permanently. These new goals place even higher attention to environmental sustainability. Of the 17 new goals, 6 relate directly to the environment, specifically clean water and sanitation, affordable and clean energy, responsible consumption and production, climate action, life below water and life on land. McArthur, John. 2013. The Declaration of the Millennium Development Goals. The Brookings Institution, March 6, 2013. Available at: https://www.brookings.edu/research/the-declaration-of-the-millennium-development-goals/. Accessed September 7, 2017. United Nations. 2000. United Nations Millennium Declaration. United Nations General Assembly, Resolution 55/2, September 8, 2000. Available at: http://www.un.org/millennium/declaration/ares552e.htm. Accessed September 7, 2017. United Nations. Sustainable Development Goals. 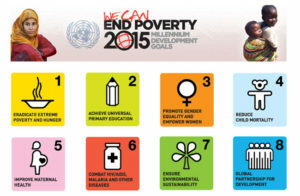 Available at: http://www.un.org/sustainabledevelopment/sustainable-development-goals/. Accessed September 7, 2017. United Nations Development Programme. Millennium Development Goals. Available at: http://www.undp.org/content/undp/en/home/sdgoverview/mdg_goals.html. Accessed September 7, 2017.